How can you get a document or file from your Samsung Galaxy Tab S2 NOOK to a printer? The idea of a tablet, of course, is to have the world in your hand: digital versions of books, magazines, newspapers, documents, and the Internet. But sometimes you need — or at least want — something in print. Check out your options. Send a copy of a file as an attachment to an email. Open that attachment on a desktop or laptop computer that’s connected to a printer. Send a file to a service bureau, like those offered at a number of office supply stores, and have them do the printing for you. Use apps and plug-in adaptations to the operating system that allow the Tab S2 NOOK to transmit a file over Wi-Fi, Wi-Fi Direct, or Bluetooth. 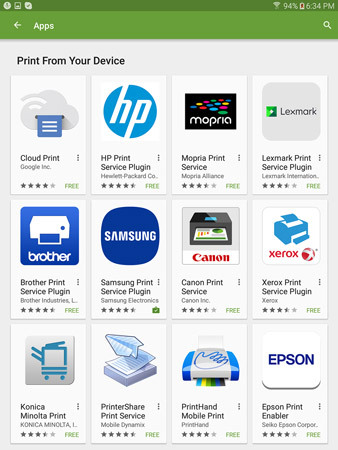 This technology is still developing; check with Samsung about its own printers, some of which have this capability. Check with other printer manufacturers that have wireless capabilities for information on availability and configuration of plug-ins. From any Home screen, tap the Apps icon and then tap the Settings icon. Tap a print service and follow the onscreen instructions. Tap Download Plug-In (if necessary). From within the Settings page, you can go to a page of apps that you can download to your Tab S2 NOOK for wireless connection. Many major printer companies are offering plug-ins that adapt the Tab S2 NOOK to broadcast files to printers with built-in Wi-Fi or other wireless systems.